Welcome to the wonderful world of HVAC. You are now among the elite few who will be providing the systems that heat and cool our homes. Being the new guy is never easy when working in the trades so I've been putting together a few items that can help you get up to speed on things. I've already given you a brief introduction to the industry and a list of tools to familiarize you with those of the trade. Now, I will give you a quick run down of the overall system; what the different basic parts of the system are and how it works. I will be using a rather typical forced air, high efficiency gas furnace and split central air conditioning system for our exercise. This is an up-flow system meaning the heating or cooling air will be disbursed upward from the top of the air handling unit as opposed to a down-flow or horizontal type install. The terminology and function of the system though is quite the same. Other optional heating and air conditioning components include humidifiers, air cleaners, UV lights, condensate pumps and more but we'll stick to the basics for now. In photo #1, you can see the "set" furnace unit. Set meaning the unit is fixed to the spot chosen for the final location of the furnace. Before we move through the system, notice photo #2. This photo shows you how the furnace is divided into 2 cabinets...the burner cabinet (top) and the blower cabinet (bottom). This is reversed in a down-flow system where the duct work is located below the unit. A horizontal unit will be set up the same as an up-flow most often and just laid onto its' side. The modifications to a horizontal unit have more to do with drainage than cabinet arrangement. (Note: A high-efficiency furnace creates condensation in the flue pipes. These pipes drain back toward the furnace and from there, discharged to a drain in the floor or a pump of some sort.) Now back to photo #1. This set unit is raised slightly off the ground by cork/rubber pads (Vibration Pads) that prevent noise that would be created by metal vibrating on concrete. Often bricks will be added as well to raise the unit further off the ground; preventing water from entering the unit should mild flooding occur in the basement. 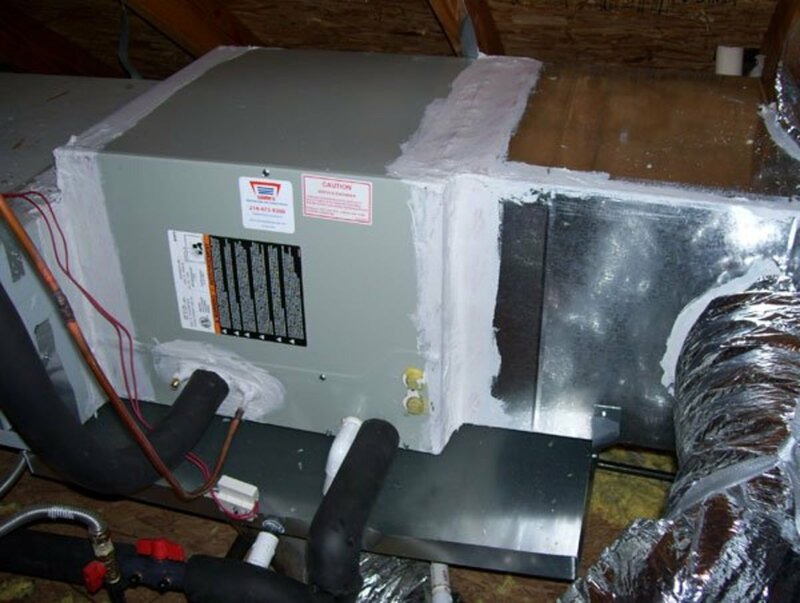 Located directly on top of the furnace is the air conditioning systems evaporator coil. This is what makes this a split system...the coil is "split" from the condensing unit that is located outside the home in most cases. Refrigerant is pumped into the evaporator coil where the pressure is changed thus changing the boiling point of the refrigerant. On top of the coil is the plenum. This is the first piece of duct work in the system that all others in the supply ducting will originate from. This could be a plenum with one opening big enough to carry the entire amount of needed supply air when located at the far end of a home or it could be a "T" plenum. A "T" plenum is used when the furnace is more centrally located in the home (suggested) and the openings on either side are sized to carry the amount of air required on each side of the home. There is also a box plenum. 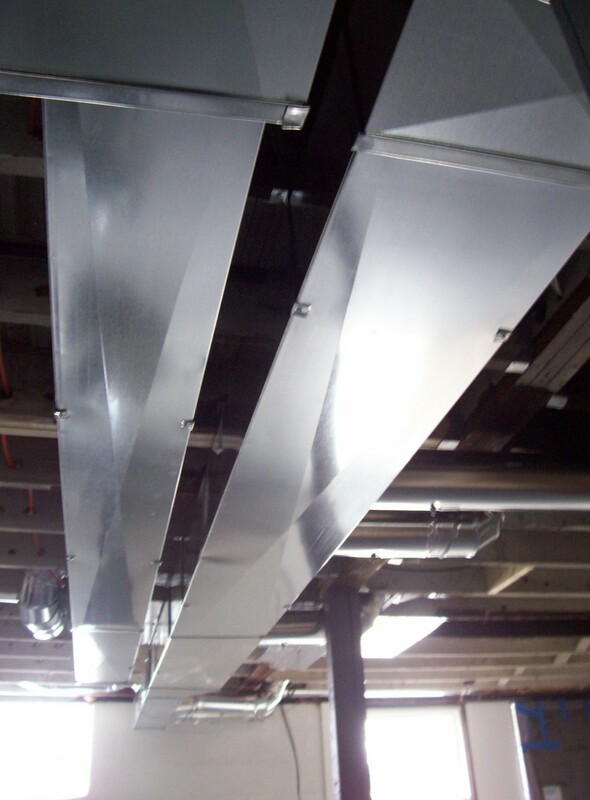 This type of plenum is used in a "spider" system where all heat runs are fed directly from the box and there is no "trunk-line". There are a few other various types but they are not as common and we'll stop at these 3 examples. Lastly, the piece of metal attached to the side of the unit you see in photo #1 is called the return air "boot". This piece is where the air will finally return to the blower cabinet. We'll come back to this as we follow the airflow through the system. Photo #4 - Duct fittings (Duct 90 on left, duct 45 bottom center, transition top center, and riser on right) Just a few examples of duct fittings. Photo #6 - Boots (The top left 2 are different types of straight boots, while the bottom boot is an example of an ell boot and on the right, an end boot example. 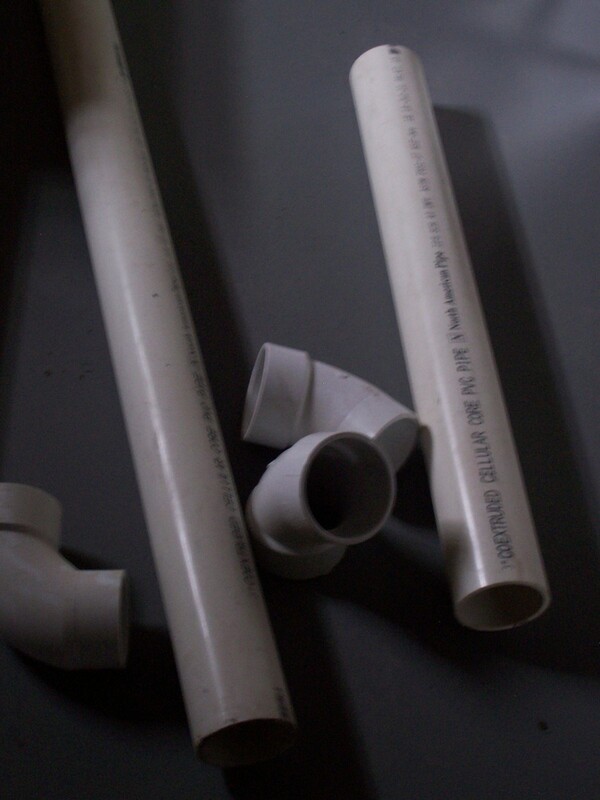 Photo #8 - PVC pipe and fittings used for the flu (chimney) on a high efficiency furnace. The supply duct is sized based on the amount of air it must move. This trunk sizing will shrink as you move down the line since air will be fed out to individual "supply runs" (photo #5) along the way. Fittings called "transitions" (photo #4) are used to make this size adjustment; thus the name transition (transitioning from one size to another). These fittings are also used on the "return air" side of the system as the same idea applies in reverse when bringing air back to the system. 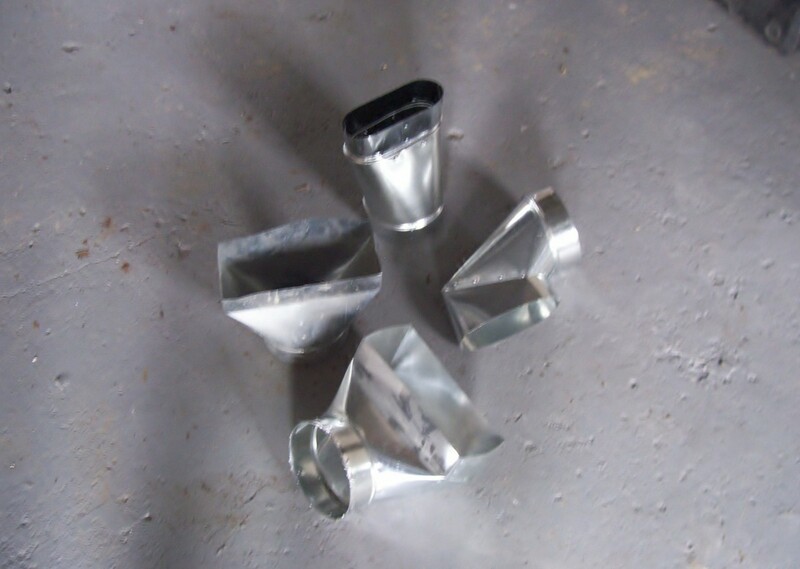 You see in photo #4 that transitions are not the only type of duct fitting. 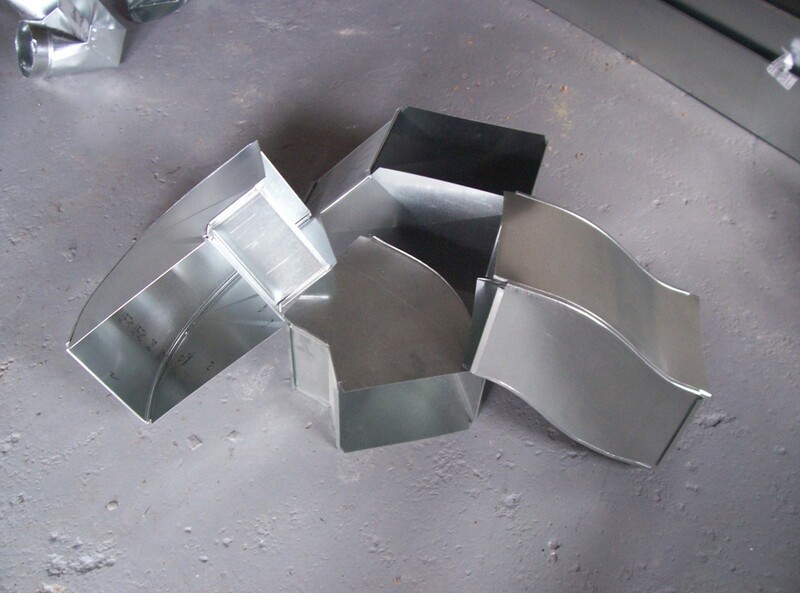 Various fittings are used to maneuver around obstacles or rise and lower to avoid beams and piping as well. The possibilities are endless but these basic terms and diagrams cover the majority of what you'd see in the field or average home. NOTE: See the handle on the pipe in photo #5...this is the handle of a "damper". Dampers are used to close off air flow to specific areas of a home. If the handle is in line with the flow of air, it is open. If positioned sideways, it is closed. 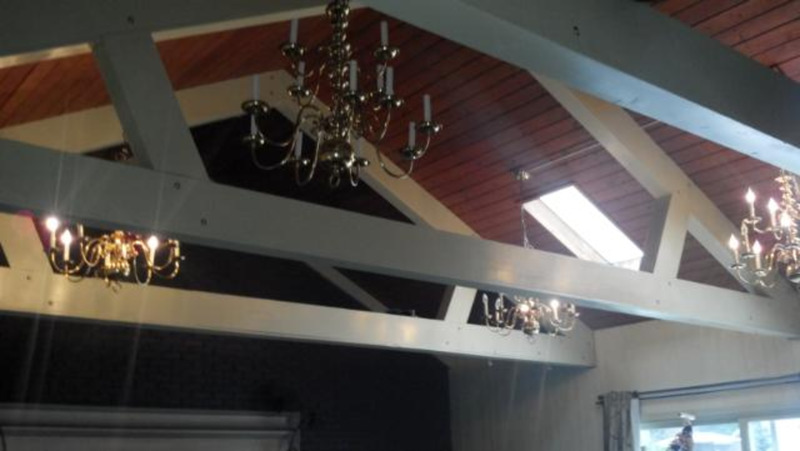 Sometimes dampers are used in the trunk-line as well to shut down whole portions of a home or to just balance the airflow better. Once the air is pushed through the trunk-lines and into the supply runs, it will be released through the register "boot". 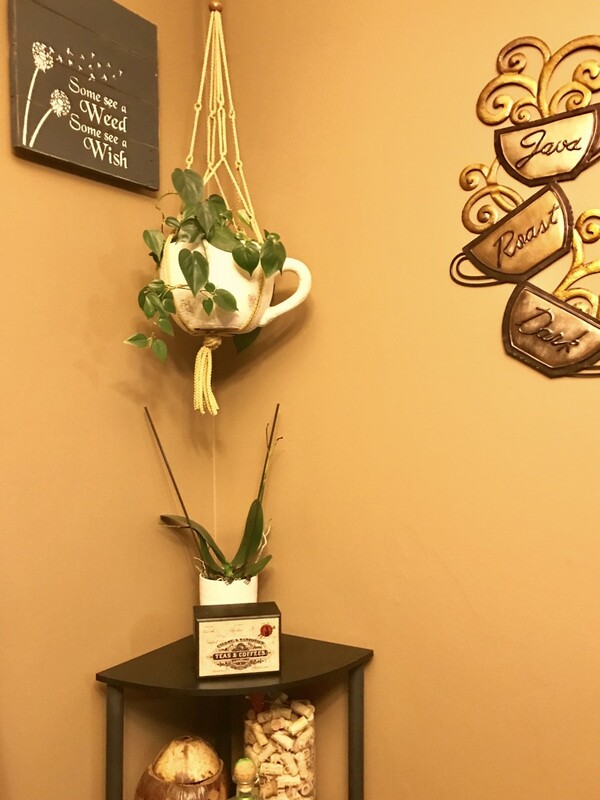 These boots come in many various shapes and sizes depending on what is needed based on the room above in relation to the structure of the home. Though they very in size and shape, they fall into one of 3 main categories. Straight boots, ell boots and end boots. Now that the conditioned air has reached its' destination and kept us cool or warm, it must head back to the furnace. Remember, it's like a lung...imagine breathing out all day without inhaling...not good. Though the fan is capable of inhaling and exhaling simultaneously, it must do both or it will "starve" for air and burn up long before its' time. NOTE: Sealing off return air is important. 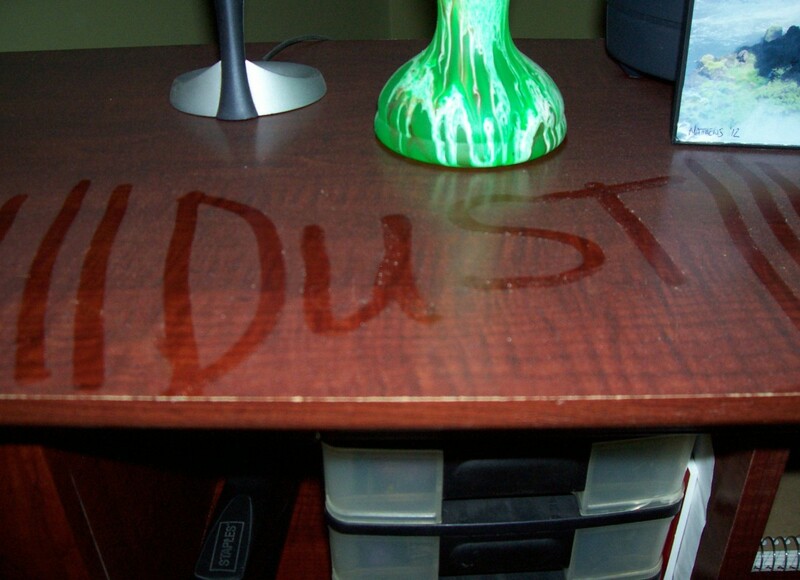 You don't want to draw unpleasant air from the basement, bathrooms, or kitchens throughout the entire house. Were you able to learn something from this information that you didn't know? Did you know that a ton of air has nothing to do with its' weight? In HVAC, the word ton is derived from the old days. They would measure the amount of cooling "power" based on how much cooling could be provided by melting a ton of ice in a 24 hr. period. How did they make ice without refrigeration? Well that's another story. 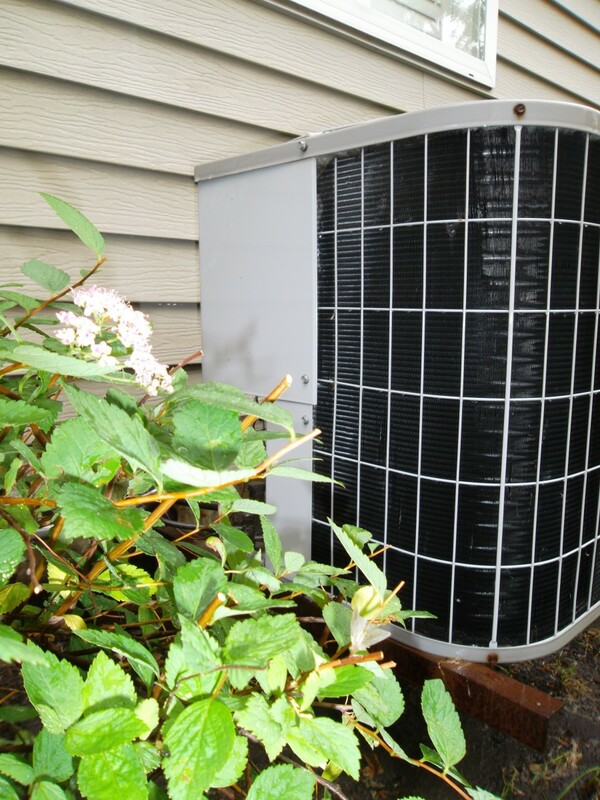 The amount of air needed in a system is usually sized based on the amount of air conditioning that the home requires. 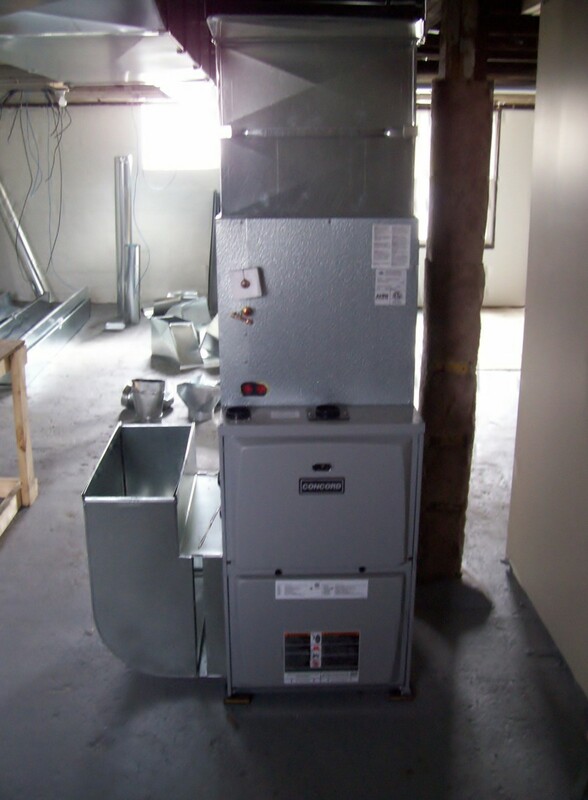 The furnace and A/C are sized to match and the fan is usually equipped to operate at various speeds as the amount of air needed to heat the home and the amount needed to be moved to cool the home are normally different. The speeds are based on CFM (cubic feet per minute). 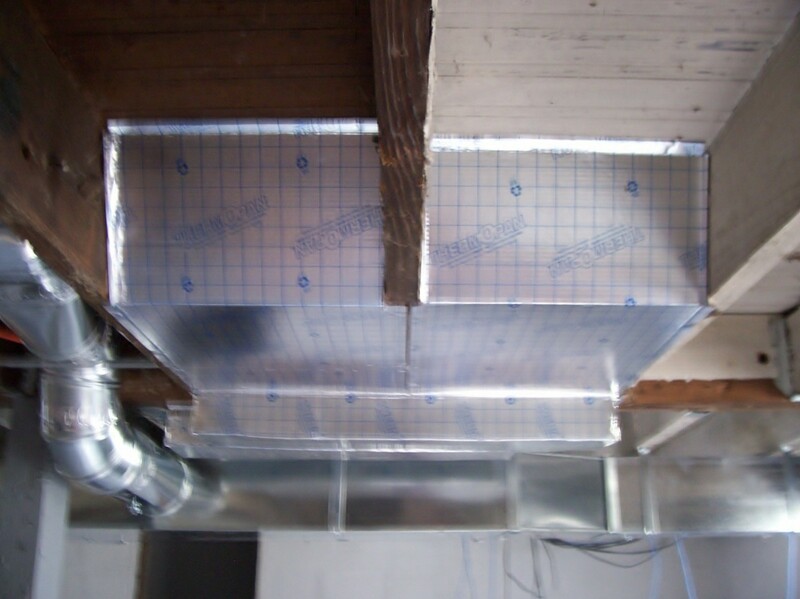 With that in mind, air conditioning is the most finicky part of the system and is used to size the ducting. 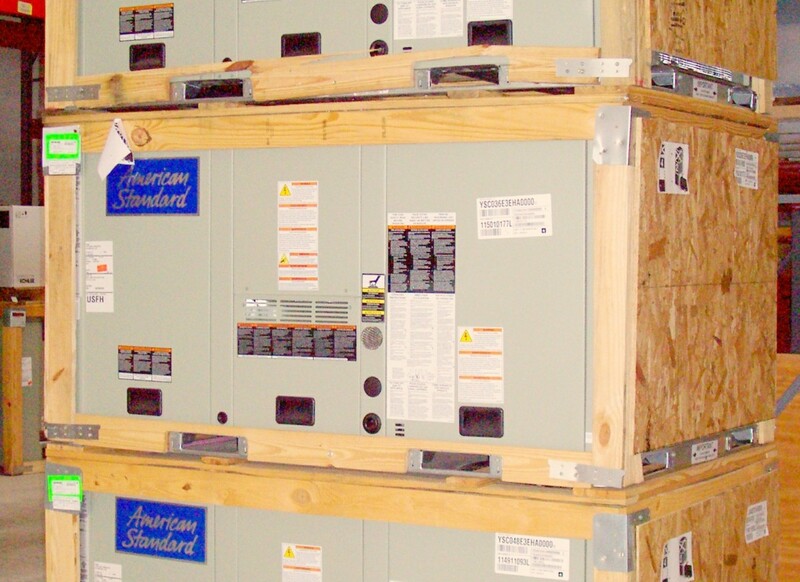 Air conditioning units are measured in tons. One ton of A/C will require 400 CFM (2 tons, 800 CFM and so on) of air to be moving across the evaporator coil in order to function at full capacity without complication or stress on the system. With this information, the duct work can begin to be sized from the furnace on down the line. 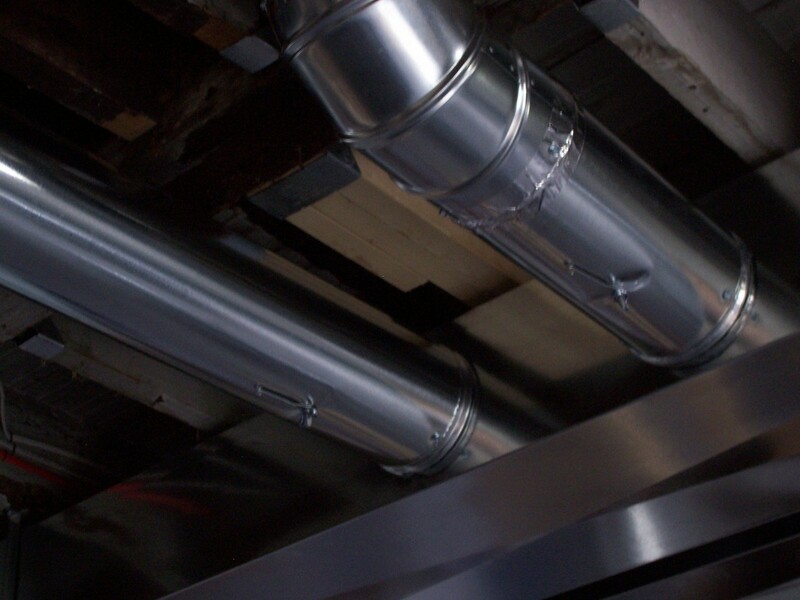 If you start with 1200 CFM and over the first 8 feet of duct you give off 200 CFM to supply runs, you will then need to transition to a smaller size duct to maintain the same airflow. Understand that this is a very basic explanation of the system and it's functions. As a "newbie", I don't want to get to scientific and freak you out. This information is intended to remove that dear in a headlights look from your face when your crew leader asks for what he feels is a very basic request. You'll win a couple brownie points and perhaps avoid having your toolbox nailed to the floor as a practical joke....well, I can't promise that but at least you'll have saved some face. No need to fireproof that I can see based on your description and really a return can be enclosed by anything. It just needs to be sealed. Kimberly - I love this question though I cannot answer accurately without more information about what exactly is being done to the flue. That said, no. It would not be included in her contract. There are a few different types of flue material and designs that might be used here so material costs vary greatly as well as the time involved. I can say if they are just replacing a few pieces of single wall flue pipe, that seems like A LOT of money for a very simple repair. I can also say that the $432 her contract cost isn't out of the norm and sounds like a good amount of maintenance she's getting in return. Don't be afraid to ask them for more details and if there is a chance they will work with you on the amount they're quoting. I would for a contract customer. They would be important to my business and I wouldn't want to disappoint them over a few bucks. 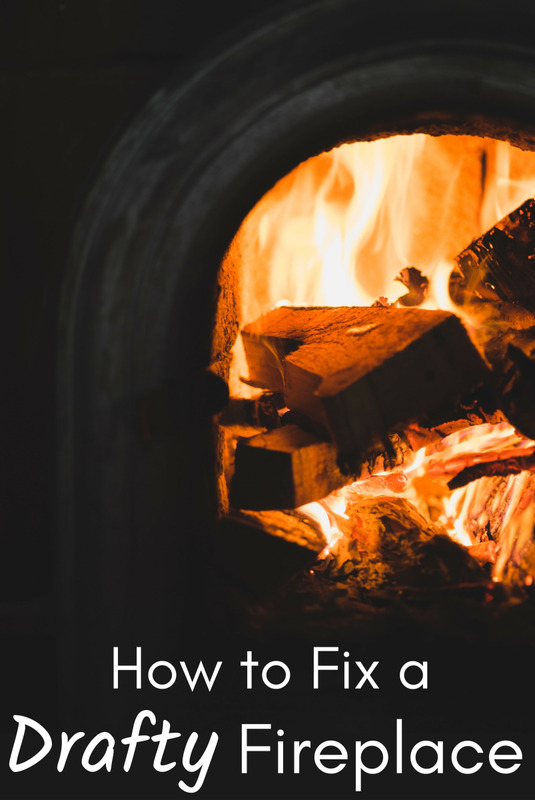 I leave you with this, if they are doing more than a few pieces of single wall flue pipe, the cost doesn't seem unreasonable and could be very reasonable depending on how far they have to go to make that repair. I could see where some situations could cost over $500-600 easy. Maybe more. I'd also want to know what they believe caused the issue. Feel free to write me with more details. What is this & should she expect that to be included in her contract that she's already paid $432. for!? But something doesn't seem right about this! 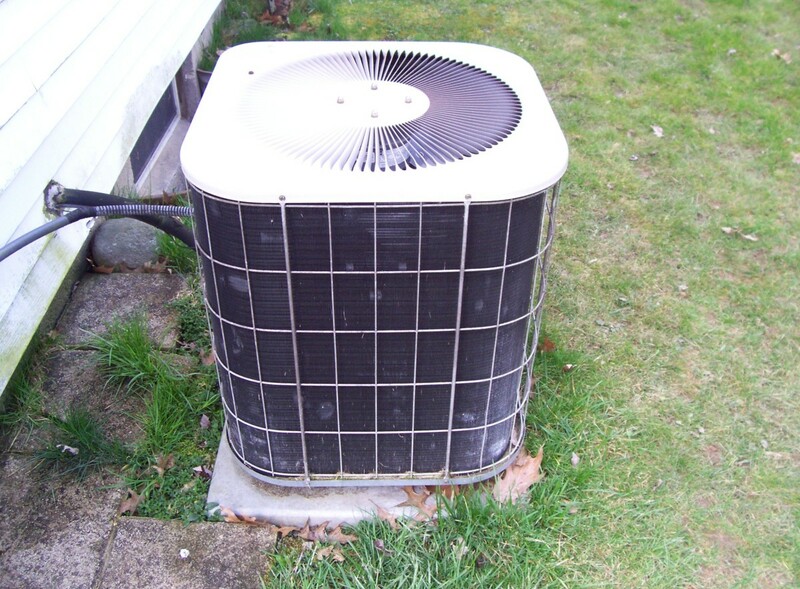 Complete selection list of all important home hvac components. It really rarely happened to me to read long articles but it is something especial for me because I read it completely start to end.. I got exceptional information here so thanks to the author for deep research on heating and cooling appliances and it's repair and maintenance. In Toronto, Mississauga if one feels to get reliable experts as I do so one service provider is so good, I personally feel! It is complete article by any aspect of heating and cooling appliances. I am so impressed by your expert views here. From now about my HVAC I am so much aware of it. I liked this comprehensive article about the care and tips of home heating and cooling system. Especially the portion related to duct cleaning. I live in Toronto and off and on call experts for maintaining my residential HVAC system. One can get the best advantage in Toronto by their reliable services. Wow. I have to say you did a good job in giving details in this article! Kudos! Informative hub Cre8tor, Very well written about HVAC. I have interest to read such kind of HVAC related articles & news. 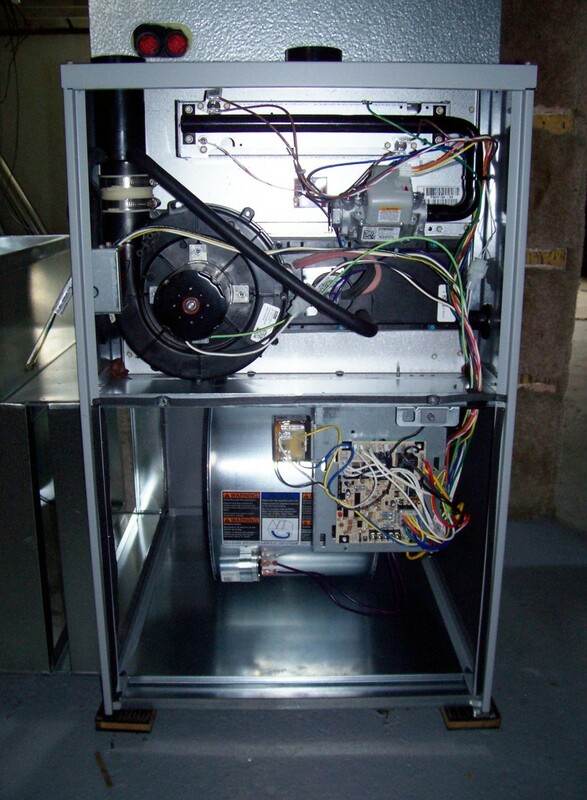 After reading this article I collect informative & interesting details about HVAC.